When I started my freshman year back in 2009 (I think we still had electricity then), I wanted to make sure I would be able to find my classes quickly during my first week. The thought of rushing around campus, late to class and looking like a lost deer, wasn’t really appealing to me. So, I developed a useful little system that helped me get to each class easily – on the first try. It’s still a good idea to take some time before the semester starts to explore campus and figure out where each class will be. I started work in the campus tech support department before classes even began, so I didn’t really have time to do this in between the mandatory 40-hour dorm-rush week and other things. This technique was my way of being adaptable. Professors know you’ll probably have a hard time finding things during your first week, so they’re likely to cut you a break. Though it’s always good to make a strong first impression – remember the Halo Effect? Still, the fact that you’re reading this probably means you’re like me. Let’s get into the technique. When creating your classes, you only need to make an event for each class once; while editing its details, you can turn on the Repeat setting and specify the days of the week to repeat the event on. You’ll notice that my classes are colored differently; back in 2009, I actually had to create separate calendars to get different colored events. That’s why you can see the calendar listing on the left column of the above screenshot. There’s a calendar for each distinct facet of my life – classes (named Calendar, as it was the default), work, CIG, exams, blocked out time for homework, and more. Now, Google lets you color events individually without creating separate calendars, so you can color-code much more easily. However, creating multiple calendars does give you to ability to turn off specific ones when you want a clearer view of, say, a particular week’s work schedule. It’s a personal thing. A link to the floor map of the building the class is in – this is the important part! To find the floor maps for the building on your campus, just Google “[YOUR SCHOOL] building floor plans” and you should be able to find them. My university has them all online, and so do several other universities I checked before writing this article. If your school’s floor plans don’t happen to be online, well… at least I tricked you into making a detailed calendar for your classes! It’ll still be useful. 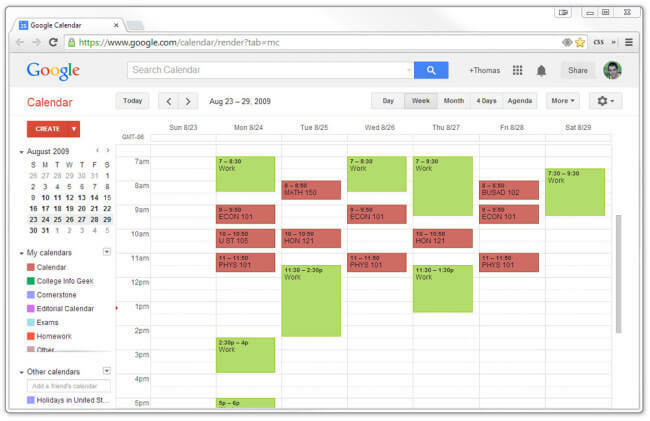 Once you’ve created an event for each one of your classes, you’ll have a well-organized Google Calendar that helps you stay organized. Furthermore, each event will have a link to the building’s floor plans. While walking around campus, you can just pull up the plan to find your way to class! Oh, and it’d probably be a good idea to also keep a link to your general campus map close at hand as well, as floor plans don’t do you much good if you can’t even find the building. I’d recommend creating a “First-week survival” document in Evernote with that map’s link and anything else you think might be good to reference while you’re getting your bearings. If you’re looking for a great calendar app for your smartphone, I recommend Sunrise – they’ve got free apps for both iPhone and Android. As I mentioned before, my move-in week ended up being too busy for me to be able to find all my classes beforehand. However, using this method, I was able to find every class and get to them all on time – without even having to wake up super-early, as I do these days.